Combining exceptional quantum efficiency with high-speed is the value proposition of the AvaSpec-ULS2048XL spectrometer. Combining exceptional quantum efficiency with high-speed is the value proposition of the AvaSpec-ULS2048XL spectrometer. Unlike many back-thinned CCD spectro-meters, which have two dimensional arrays the ULS2048XL has large monolithic pixels of 14×500 microns with exceptional efficiency in the UV from 200-400 nm and the NIR from 950-1160 nm. The instrument also has an electronic shutter, which enables integration times as low as 2 microseconds. To further enhance sensitivity a detector collection lens is available which improves sensitivity up to 60% when combined with larger core fibers. Options include order-sorting filter to reduce 2nd order effects, purge ports for deep-UV measurements. The AvaSpec-ULS2048XL comes with a wide range of slit sizes, gratings and may be configured with SMA or FC/PC fiber-optic entrance connectors. 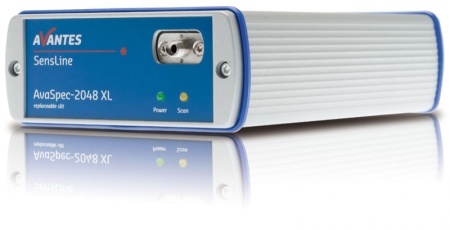 The AvaSpec-ULS2048XL is also available in dual or multi-channel versions (up to 10 spectrometers), where all spectra are acquired simultaneously. Connection to your PC is handled via a USB2-connection, delivering a scan every 2 milliseconds. The instrument comes complete with AvaSoft-basic software, USB cable and an extensive manual, including a quick start guide in four languages. AvaSpec-ULS2048XL-USB2 Ultra-low Stray-light Fiber-optic Spectrometer, 75 mm AvaBench, 2048 large 500 µm pixel back-thinned CCD detector, USB powered, high-speed USB2 interface, incl. AvaSoft-Basic, USB interface cable.